Learning to comfort yourself in healthy ways is one of my key philosophies to living well. 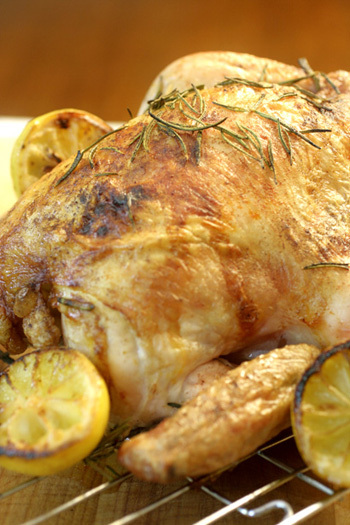 Home-made food is the best way to do that, take a simple roast chicken for example. What is the key to pulling off a flavorful, moist roast chicken? It’s as easy as 1-2-3 or rather 1-2-3-4. Follow this easy guide to get it right, each and every time. Look for a 3 1/2 pound bird if you plan on feeding four – preferably an organic bird if it’s in your budget. The fat should be white and even around the bird, without bruising or yellow fat. Remove the neck and gizzards from the inside of the bird. You can save them to make gravy if you wish or dispose of them. Rinse the chicken well under cold running water and pat dry with paper towel. Sprinkle the outside with 1/2 teaspoon of salt and preheat the oven to 350ºF. Heat a large skillet over high heat and coat with cooking spray. Place the bird breast-side down in the skillet and cook 2 to 3 minutes until a golden crust forms. Turn the bird over and slide into the oven. Roast 30 minutes at 400ºF. Decrease the oven temperature to 350ºF and continue to roast 45 minutes to an hour until the meat along the leg reaches 165ºF when pierced with a meat thermometer or until the juices run clear when pierced with a knife. Here’s a restaurant chef’s tip to keeping meat moist: Once the meat is cooked through, let the bird rest outside the oven for at least 5 minutes before slicing. This allows the meat fibers to relax and the juices to redistribute evenly, which means juicer meat. Slice and enjoy!